The BBC reported today on a boat filled with desperate people in the Andaman Sea. Apparently ten people on the boat have already died from starvation or dehydration, while others are resorting to drinking urine. 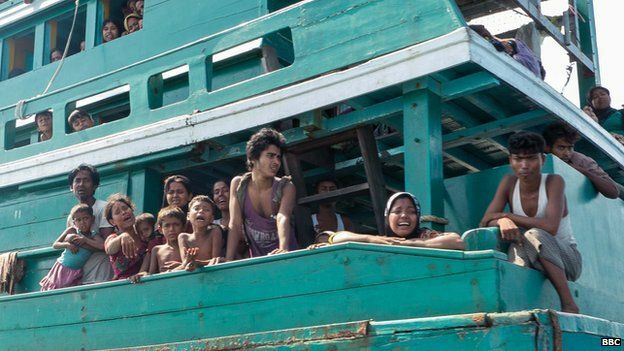 350 Rohingya people, from Myanmar, are said to be aboard, drifting, having been refused entry to Thailand. This is just one of many such boats currently drifting off the coasts of Thailand, Indonesia and Malaysia. The Rohingya are one of the most oppressed ethnic/religious minorities in the world, having no recognition as citizens in Myanmar, and therefore having experienced constant persecution. According to the BBC’s Jonathan Head, who can be seen in a video at the top of that report, “no-one wants them”. It’s quite striking when a journalist feels able to make that kind of judgement. But that is the world we live in. Closer to home, meanwhile, the European Union has this week announced a new approach on its own “migrant” crisis, which follows the decision to scrap Mare Nostrum in October last year. This involves a new quota system aimed at allowing in a higher number of people (20,000 over two years) and distributing them fairly across member states. Even this reasonably moderate proposal was met with total rejection by Britain’s Home Secretary, Theresa May, who claims that these people leaving war-torn countries and despotic regimes are merely “economic migrants”, and that we shouldn’t encourage them. The EU’s approach also contains some far more worrying plans. In particular, the proposal for a “military campaign” to “smash” smuggling networks should strike fear into the heart of any reasonably compassionate person. The Guardian reported that this would be at least an air and naval campaign – but that it might also include “a presence ashore”, which is a quite spectacularly horrifying euphemism. This is all awful, of course. Both situations have been created by a lack of liberty – both in terms of the countries from which these people have already fled, and in terms of the response from the rich old nations to which they want to flee. The solution cannot lie in reducing freedom yet further. Whether it is Indonesia or Britain, the reality is that by turning such people away, you are actively choosing to contribute to their deaths. Moreover, “cracking down” on the smuggling networks – as I’ve suggested before – is meaningless without providing a legal, safe alternative. It is not as if these people want to use such networks. They use them because they have no other choice. The smuggling networks are a classic black market, created by prohibition; they’re the equivalent of bootleg liquor or cocaine cut with ground glass. Except instead of intoxicants or narcotics, these people just want to live in a place that isn’t so irredeemably screwed up beyond repair that their very lives are worthless. And they’re willing to do anything – literally anything – to get to that place. Any of us would do the same. And this is the biggest irony of all. The very hope that these people embody is another side of the “aspiration” that conservatives preach to their citizens. The same hope that drives people to get into rickety boats and drift for weeks without food or water is what is supposed to drive people in UK JCPs to keep applying endlessly for the same McJob. It doesn’t seem to have occurred to conservative, aggressive, anti-immigration governments that shutting these people out doesn’t just tell them no-one wants them. It sends a message to anyone without hope: get out and stay out, because we don’t want your type here. ← What Kind of Leader Do the Liberal Democrats Need? Phuketwan talked with boatpeople today in what’s believed to be the first direct account from the fleeing Rohingya and Bangladeshis caught up in the present wave of boats stranded at sea. The strandings follow a crackdown on trafficking camps in Thailand and the refusal of Malaysia and Indonesia to allow more boats to land. Through a translator, 10-year-old Muhammed said that he had been kidnapped and never intended to leave his parents in Burma. Kidnaps have been reported more frequently over the past year, most often from Bangladesh, as touts entice or coerce young men mostly to try their luck at better paid work in Malaysia. The 10-year-old boy’s account is the first that Phuketwan has heard of a child being kidnapped alone from Burma, also known as Myanmar.